Above & Below: BB Couture's Hammer Drill shown using 2 coats. Above photo is with a flash, below photo is no flash. Both pictures were taken outside under snowy skies. Below: BB Couture's Stud Finder shown using 2 coats. This picture was taken with a flash, while the photo below is shown with no flash. Below: Stud Finder with one coat of Essie's Matte About You. 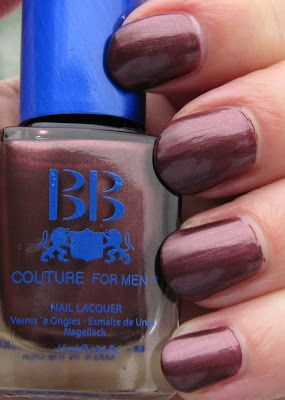 Here are 2 more shades from BB Couture's latest collection of polishes for men, Hammer Drill and Stud Finder. I kept hearing Hammer Time Can't Touch This in my head as I was swatching Hammer Drill, so now that I've gone and gotten it stuck in your head, let's talk about this color! Hammer (Time) Drill is a shade that falls into the burgundy/maroon/wine family, although there's something about it that makes it difficult to fit into any of those families. I really like this shade, but again, I'm having a hard time defining the color. I'd call it a muted or dusty burgundy shimmer with the slightest hint of a brown undertone in darker lighting. The shimmer is mainly gold, but again, it too is somewhat muted, making it difficult to define. Stud Finder is also a unique and very pretty color, and again, to define what the shade actually would be called, is causing me a slight problem. As I was applying it, I thought it almost looked as if gold, silver and bronze had been mixed together, because I saw traces of all three of those colors. 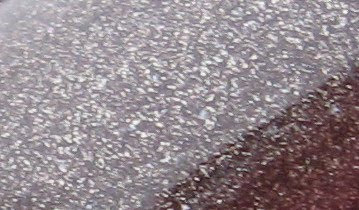 This too is a shimmer, and I can see both a bronzed gold and a silver tone within the shimmer pieces, although the silver is much more evident. Once applied, I'd have to say that the best description is a deeper taupe shade. I wondered what it would look like with a matte finish, because it reminded me of OPI's You Don't Know Jacques from their matte collection. One coat of Essie's Matte About You convinced me that indeed, it is very similar. The matte coat darkened the shade slightly and refined the shimmer. 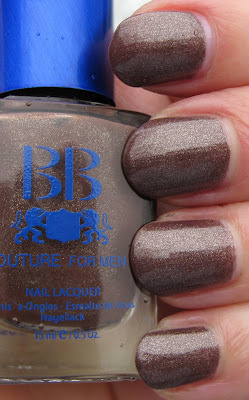 I'll finish up with the newest BB Couture men's polishes tomorrow, and then move onto their earlier collection of polish for men. Overall Beauty is still offering their free shipping offer, valid through 12/11 . Make sure and check out their newest polishes called The Disco Collection. Oh great, now I'll have Dancing Queen stuck in my head! And I usually don't like brown nail polishes! I really like these shades on you. I just can't imagine a man wearing them. Maybe if I wear Stud Finder on my nails it will really work man-wise! I'm glad your swatching these because I really can't tell what they look like on OverallBeauty. Thanks Mary!